1. Create a new blank document and set the canvas size to 800 x 600px. 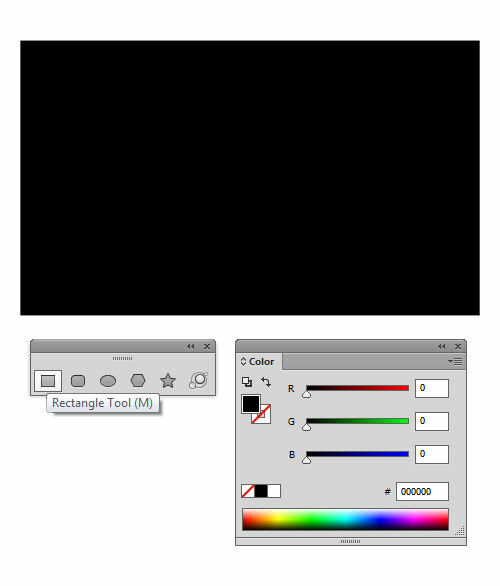 Select the Rectangle Tool (M) from the Tools Panel on the left and draw a rectangular shape with the following dimensions: width – 800px, height – 480px. Go to Color Panel and set the fill color of the selected object to pure black (R=0, G= 0, B= 0). 2. 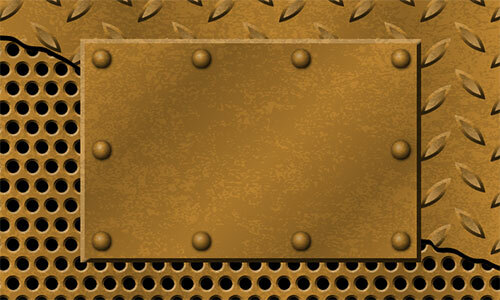 Let’s create our first background element, a metal texture. First, make a copy of the previous object and place it on top of it. To create a crack along the metal texture, grab the Pencil Tool (N) and draw two long wavy lines – one below the other. Select both the lines and the object that lies beneath and in the Pathfinder Panel click on the Divide button, so we get separated surfaces. Once done, ungroup the objects (Shift+Ctrl+G). Now select the tiny middle part and get rid of it. Once done, keep the two remaining objects selected and fill the objects in alternating colors of light brown (R=186 G=130 B=49) and medium brown (R=140 G=98 B=37). Place the objects over the black background. Duplicate those two items and keep them for later. 3. It’s time to create our first seamless metal texture. Using the Ellipse Tool (L), create a black circle and set the dimensions to about 20 x 20px. Apply a stroke to the path and then set the Stroke Weight to about 3px. 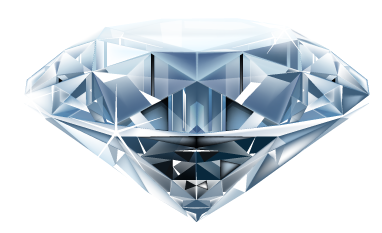 In Adobe Illustrator CS6 we have the ability to apply gradients directly to the strokes. So, keep the object selected and apply the gradient within the stroke by clicking first option in the Gradient panel. Now fill the resulting shape with linear gradients: burlywood (R=214, G=180, B=131), dark goldenrod (R=186, G=130, B=49) and black (R=27, G=18, B=4). 4. Make sure the object is still selected, and choose Object > Pattern > Make and the warning screen will appear. Once you click OK to close notification message, Illustrator takes you into the Pattern Editing Mode. First, go to Window > Pattern Options to activate the control panel that allows much more control over both existing and custom patterns. When the Pattern Options box appears, give the pattern a name, in this case “Perforated Plate Pattern”. You can follow the directions given below, but you can also choose a lot of other options there. Once you are happy with the results, just click Done at the top left of the screen, and you are back in normal mode. If you decide you want to make some further adjustments, just double click our new pattern from the Swatches panel. Now bring out the first copy we created in Step 2. Pick the pattern from the Swatches Panel and apply it to the selected object. You should end up with something that resembles the following figure. 5. Pick the Ellipse Tool (L) and draw a long thin, horizontal ellipse whose dimensions should be set to 60 x 20px. When you’re done, using the Direct Selection Tool (A) select both anchor points as shown below and click the ‘Convert selected anchor points to corner’. Open up the Gradient Panel and fill the shape with linear gradients as follows: burlywood (R=200, G=155, B=90), dark goldenrod (R=186, G=130, B=49) and dark brown (R=47, G=33, B=12). Then, go to Object > Path > Offset Path… and in the dialog box set the Offset to -4.5px. Now change the gradient colors of the selected object to the following: burlywood (R=200, G=155, B=90) and medium brown (R=128, G=89, B=33). Select both objects and group them together (Ctrl+G). Keep the objects selected, and rotate them by 45&deg. Make a copy of the objects we have just created, then rotate them again and move them to the desired position, as shown below. 6. Once done, select Object > Pattern > Make to open the Pattern Editing Mode. When the Pattern Options Panel appears, give our new pattern a name, let’s say “Diamond Plate Pattern”. Make sure you have entered the values as shown in the figure below. When you are satisfied with your settings, click Done at the top left of the screen to confirm. Bring out another copy we have created earlier in Step 2. Now apply the pattern to the object by selecting the object and clicking on the pattern in the Swatches Palette. 7. Let’s create a metal plate and attach it to the metal background. Grab the Rectangle Tool (M) and draw a rectangle, whose dimensions should be set to about 475 x 310px. Now, go to the Gradient Panel and fill the selected object with linear gradients as shown below: burlywood (R=200, G=155, B=90) and dark brown (R=47, G=33, B=12). Make a copy of the rectangle and scale it down a bit. Keep the object selected and fill it in alternating colors of light brown (R=186, G=130, B=49) and medium brown (R=140, G=98, B=37). Those objects should be placed in the middle of the background. 8. We need to add some evenly distributed rivets along the edges of the metal plate. First, pick the Ellipse Tool (L) and draw a 25 x 25px circle (hold Shift to constrain the proportions). Open up the Gradient Panel and fill the resulting shape with the following colors: burlywood (R=214, G=180, B=131), dark goldenrod (R=186, G=130, B=49) and dark brown (R=47, G=33, B=12). Once done, go to Effect > Stylize > Drop Shadow… to open the dialog box. Apply the values you can see below and confirm with OK. Make nine more copies of the element so we have a total of ten, and place them as shown in the following image. 9. Some rusty metal texture would really finish it off nicely. Pick a texture of your choice (or google it). Find the texture that best suits your needs (no real requirements for this except it’d probably be best if it is already turned into vector). Once you find the texture you want to apply, just pick the texture and paste it into your Illustrator document (File > Place…). We have adjusted the size of the texture so it fits perfectly on our background. Go to the Color Panel and set the color of the selected object to light grey (R=204, G= 204, B= 204). In the Transparency Panel set the Blending Mode to Multiply (Opacity 50%). We’re done with the tutorial now. I hope you liked it.